The award-winning Mountain Trike – described by The Guardian as “The Bear Grylls of the wheelchair world” – has already taken its users up Snowdon, around the Peak District and across Africa. Its inventor Tim Morgan famously turned down an offer from Dragons’ Den to invest in the product after the millionaire investors wanted too large a share in the business. Since then the company has gone from strength to strength and has won an army of fans who are able to go off-road by controlling the wheels with levers. A single wheel at the back ensures stability and the engineered suspension ensuring users do not tip over. 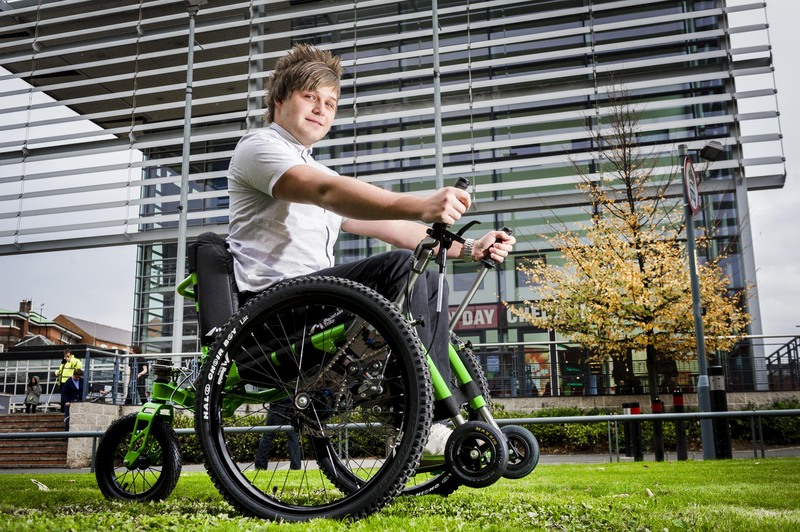 DMU student Ben Cook, a second year ICT student, has tried out the trike and loves it. He said: “For instance, last year I lost three days of studying because of the snow. If it snows this year I could use the trike. As well as getting out in snow, it’s really good at getting up and down kerbs and can be used on multi-terrain surfaces, including grass, stones and so on. Ben was 12 when he caught a common cold virus, which was the catalyst for his Transverse Myelitis – where his white blood cells, which normally protect your body, turned against themselves and started attacking his spinal cord. It took him two years to learn to walk again but then suffered eight more attacks which left him completely paralyzed. It took him until 2011 to regain proper use of his arms but he now needs to use a wheelchair. Ben said: “It looks like a tank but when I sat in it, it was easy to maneuver. After my first use of it, I was quickly able to use the trike and it was really comfortable, especially the back area which you might need if, for example, you use it to go up a mountain. DMU’s Student and Academic Services took delivery of the Mountain Trike earlier this year. It is available for any disabled student to use. The Trike has been developed in partnership with injured soldiers at the British Army rehabilitation centre in Headley Court, Surrey.